Why choose a Bridal Set Ring? Once your partner has popped the big question it's time to start shopping for the ring. Here's why you should consider a Bridal Set Engagement Ring. Bridal Sets offer many advantages over Engagement Rings and Wedding Bands that you may purchase separately. So, what are these advantages? And why should I purchase a Bridal Set? I hear you ask, well we are going to explain all of the benefits of a Bridal Set. Depending on your preference, you may want contrasting metals for your Wedding and Engagement Rings, especially if you are trying to create a unique and quirky style. Although, many of our customers like to choose the same metals for both their rings and that is why the Bridal Set is perfect for this. By choosing a Bridal Set you can beautifully compliment both rings as you will have an exact metal match, as they are both handcrafted at the same time. When buying rings separately, even though they may be the same metal, there may be slight colour variations and differences. There are no limits to the metals that are available for all of our Bridal Sets. If you are after a vintage and chic style Bridal Set then our 18ct Rose Gold Metal range is the a perfect choice for this classic style. If you are looking for something which is slightly more modern and traditional, then our beautiful Palladium Metal selection would be the ideal choice. Rather than having a set of similar styles of rings, by choosing the Bridal Set it will beautifully compliment the Engagement Ring, as it will have the exact same unique design. Instead of looking like two or three different pieces of jewellery, the Bridal Set looks like just one stunning ring. Not only is this look synonymous with any elegant bridal style but it also showcases a symbol of love and union. Purchasing your Engagement and Wedding Ring separately can create a truly elegant and eye catching style, but they are not always comfortable to wear. The importance of Wedding and Engagement Ring comfort cannot be underestimated, as you will be planning to wear these beautiful pieces every day of your life. 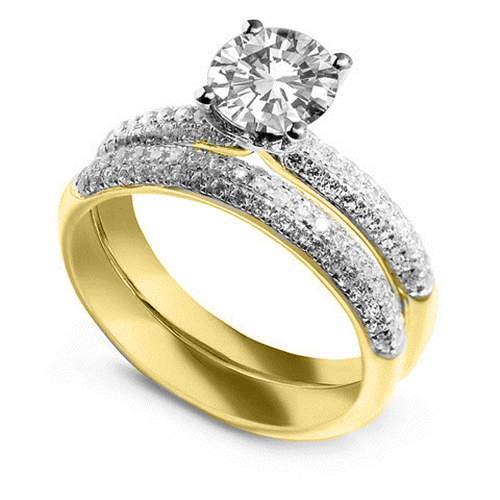 The alternative to this is the very convenient and stunning Bridal Sets, we have available. A traditional Bridal Set is worn as just one main ring, which can be far more comfortable and can feel more natural to wear for many brides. Some Bridal Sets can also feature two separate wedding bands that will hug the Engagement Ring from both sides. Within the Bridal Set the Wedding Band & Engagement Ring are designed and handcrafted crafted to fit together seamlessly, which makes it a much more comfortable choice. Not only will this be significantly more comfortable but it also focuses the attention on to the star of the show, the beautiful Engagement Ring. One of the best things about choosing a Bridal Set is that it draws all of the attention to the beautifully hand cut diamond on the Engagement Ring. The Engagement Ring is always meant to be the star of the show, but sometimes can become lost amongst other contrasting Wedding Rings. By choosing a Bridal Set you then have the option to choose a truly showstopping Diamond Engagement Ring, which not only compliments the wedding band but stands out on your hand. Solitaire Engagement Rings are the perfect choice in a Bridal Set, as they are used as a symbol to express one's true love for a lifetime partner. The centralised setting of the beautifully hand crafted diamond makes for an eye catching piece. The ring can come in a variety of simplistic, yet beautiful metals, which will make the dazzling diamond turn a few heads. Never forget it is crucial to choose the perfect diamond which truly represents your personality and also compliments the chosen metal. Our Diamond Shoulder Set Ring With Matching Band is the perfect example of how a Solitaire Engagement Ring can beautifully compliment and accentuate the diamond in a Bridal Set. One of the most appealing features of the Halo Engagement Ring for a any bride is the limitless options of the shapes, which are available for the central stone such as: Round, Princess, Oval, Emerald Cut, Pear, Cushion Cut and Marquise diamonds. All of these diamond shapes can be customised to make sure the engagement ring is the eye catching feature. Another reason why the Halo Engagement Ring is perfect for any Bridal Set is the unique design of the main diamond. The central stone is encircled by beautifully delicate pave and grain set diamonds, which make the central diamond look even bigger! The perfect example of a beautiful Halo Bridal Set is our Modern Round Diamond Halo Ring With Band. The central diamond is beautifully encircled by precisely hand cut diamonds, which truly brings the ring to life and adds a sophisticated and glamorous touch. We hope this post has helped you decide on whether a Bridal Set is the right choice for you and how it can compliment your style and taste. Whichever Bridal Set you decide to choose, we can assure you it will be a truly eye catching piece and will also give you the extra radiance that you're looking for. Should you have any further questions about our Bridal Set range and why it is the perfect choice for you then please get in touch with us today or feel free to book a consultation with one of our experts.